پژوهش زیر به بررسی سیستماتیک روزن‌بران موجود در بخش حوض‌خان از سازند نایبند در 25 کیلومتری جنوب مقطع تیپ می‌پردازد. 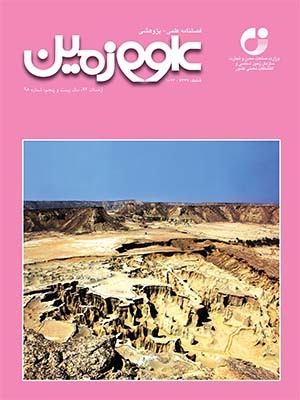 رخنمون مطالعه شده در شمال باختری منطقه دیگ رستم، در فاصله حدود 300 کیلومتری شمال استان کرمان قرار دارد و شامل تناوبی از آهک‌های ریزدانه، متوسط تا ستبرلایه‌ای است که حاوی اسفنج‌ها، جلبک‌های داسی‌کلاداسه، دوکفه‌ای‌ها، مرجان‌ها و روزن‌بران به نسبت فراوان با سن تریاس بالایی (نورین- رتین) است، که عموماً از خانواده Aulotortid هستند. نمونه‌های روزن‌بران شناسایی شده شامل این جنس‌ و گونه‌هاست:Auloconus permodiscoides, Aulotortus friedli, Aulotortus tenuis, Aulotortus tumidus, Aulotortus sinuosus, Duotaxis birmanica, Tetrataxis inflata, Agathammina austroalpina, Miliolipora cuvillieri, Planiinvoluta sp., Ophthalmidium leischneri, Ophthalmidium exiguum, Glomospirella sp., Trochammina alpina, Diplotremina astrofimbriata, Diplotremina subangulata, Duostomina sp., Nodosaria sp1., Nodosaria sp2., Pseudonodosaria sp., Austrocolomia sp., Sigmoilina schaeferae, Reophax tauricus,. در این مطالعه ارتباط تجمع روزن‌بران شناسایی شده با لایه‌های کربناتی و ریف‌ها نیز مورد بررسی قرار گرفته است که مجموعه یاد شده، عمدتا گویای تشکیل رسوبات آهکی در مناطق کم‌انرژی، خلیج‌های کوچک و آرام یا لاگون‌ها، رمپ‌های کربناتی مناطق کم‌ژرفا و رخساره‌های ریفی هستند. This paper describes systematic of the foraminifera from Howz-e Khan Member of Nayband Formation in 25km south of the type locality which are exposed in northwest of the Dig-e Rostam area about 300km north of Kerman city and is composed of medium to thick bedded fine-grained limestones containing sponges, dasycladales algae, bivalves, corals and partly abundant upper Triassic foraminifera ofNorian-Rhaetian ages which are mainly of aulotortid types. The following foraminifera taxa are described: Auloconuspermodiscoides, Aulotortus friedli, Aulotortus tenuis, Aulotortus tumidus, Aulotortus sinuosus, Duotaxis birmanica, Tetrataxis inflata, Agathammina austroalpina, Miliolipora cuvillieri, Planiinvoluta sp., Ophthalmidium leischneri, Ophthalmidium exiguum, Glomospirella sp., Trochammina alpina, Diplotremina astrofimbriata, Diplotremina subangulata, Duostomina sp., Nodosaria sp1., Nodosaria sp2., Pseudonodosaria sp., Austrocolomia sp., Sigmoilina schaeferae, Reophax tauricus. In this paper relation of foraminifera with reefs and carbonate layerthat are generally typical of low energy, bay or lagoon-type, on shallow carbonate ramps and reef facieshas been studied.